The gift that keeps on giving: Are city taxpayers still paying for donation to Art Museum? City keeps moving $2 MM contribution forward; is mum on where the money’s going. 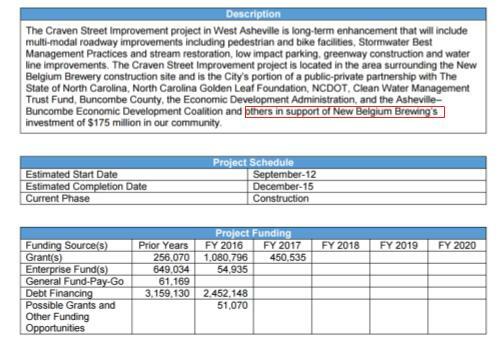 In June 2013 city council passed Asheville’s first significant tax increase since 1995. The resulting revenue was to be used for what councilor Gordon Smith called “aspirational” projects, including road repair, parking deck construction, affordable housing … and improvements to the Asheville Art Museum. The art museum’s share of the proceeds was to be $2 million, a contribution amounting to one-third of the shortfall amount identified by Mayor Bellamy earlier that year. It was to go towards the museum’s campaign, begun in 2006, to raise $24 million for extensive expansion and renovation of its space in the Pack Place Arts and Cultural Center. But that didn’t happen right away. In fact it hasn’t happened at all yet. Instead, although the tax was levied and collected -- and apparently is still being levied and collected -- the city’s $2 million present to the art museum has been bumped forward in the budget each year. Then there’s the timing. The art museum has now begun work in earnest to remodel and enlarge the Pack Place building. That, in turn, follows several years of controversial actions by the museum. These include directly profiting from the city’s hostile – and possibly illegal – takeover of Pack Place, defaulting on two county Tourist Development Association grants, and attempting to sell naming rights to a corner of Pack Square that is public property. 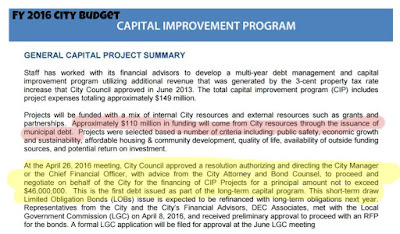 The city’s Capital Improvement Program, inaugurated in 2014, is a rolling budget plan supposedly designed to anticipate and provide for infrastructure maintenance. 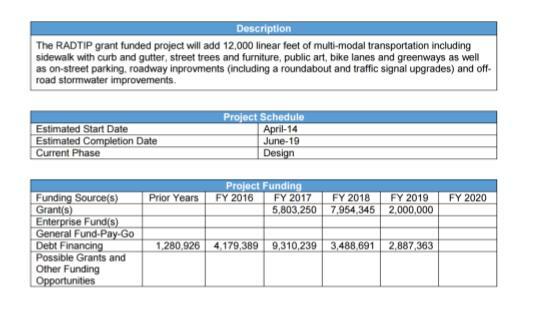 It projects estimated costs for such projects five years into the future and is updated every fiscal year. In April of 2016 the city issued $46 million worth of limited obligation bonds to set against this figure, but that still left a shortfall of $54 million. 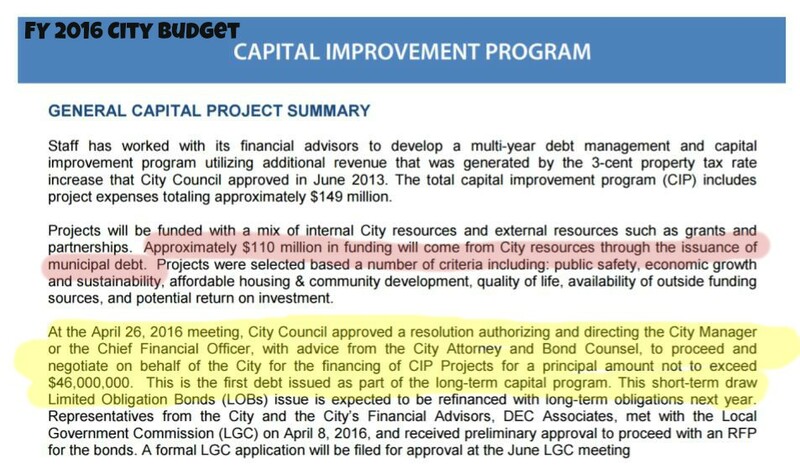 Presumably the $74 million in GO bonds just authorized would cover that amount, with some left over. Not in the Bond Referendum... or is it? A contribution to the art museum’s own capital improvement fund is not among the 61 designated expenditures listed in the three-bond package. Conceivably it would be covered by that $20 million cushion. For that matter, the itemized bond expenditures are essentially suggestions only. The bond language says the moneys “may” be used for those purposes, not “shall” be. A given bond may be used to finance any expense at all that can be made to “fit” into its category. Critics have for several years looked askance at the art museum’s cozy relationship with city government. In July of 2013, former mayor and city manager Ken Michalove caused what Mountain Xpress called “a brief ruckus” by asserting at a council meeting that then Vice Mayor Esther Manheimer and Councilor Marc Hunt, as well as City Manager Gary Jackson, had acted unethically by supporting the $2 million contribution to the art museum’s project. Manheimer and Jackson, Michalove said, should have recused themselves because they were personal friends of museum director Pam Myers and the Van Winkle Law Firm, where Manheimer practices, had once represented the museum. Nothing came of Michalove’s objections. In 2013 the museum entered into secret negotiations with the city for a separate, direct lease on its Pack Place space, in effect seceding from its Pack Place membership. Then in April of 2014 the city engineered a hostile takeover of the Pack Place property and handed the museum the space vacated by the Coburn Earth Sciences Museum, which had been forced out by the prospect of having to pay higher rent. The art museum expanded into the Pack Place common space as well, forcing Diana Wortham Theater’s ticket office to abandon the foyer and use a side entrance. And a large metal sign reading “Asheville Art Museum” was placed over the stone inscription “Pack Place” over the building’s front door. But in fact the art museum, apparently acting on the premise that it is easier to ask forgiveness than permission, had already made the naming rights deal with SECU. On October 28 council gave its after-the-fact blessing, despite the Pack family’s reminder that George Pack’s bequest of the square property to the city contained an ironclad clause that it was to be used as a public park in perpetuity. And the SECU Plaza idea quietly went away. It is not known whether SECU contributed to the museum on another basis. 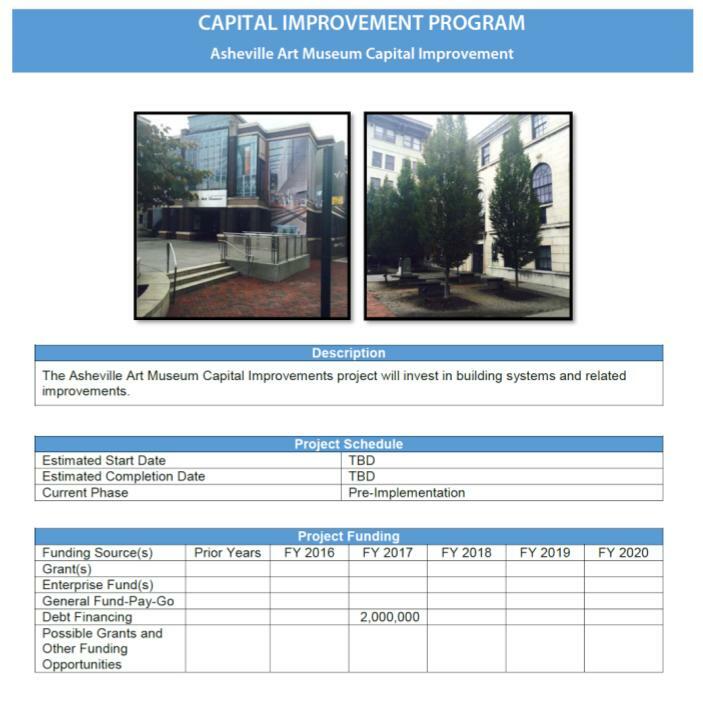 “ In 2013 the city passed an $.04-per-$100 property tax increase designed to finance several projects, including a $2 million grant to the Asheville Art Museum. Documents indicate that the city put this money in the CIP and has continued to nudge it over into the following year's budget; it is now listed in the FY 2017-2018 expenditures (see attached). As of today (January 30) Whitehorn has not responded.